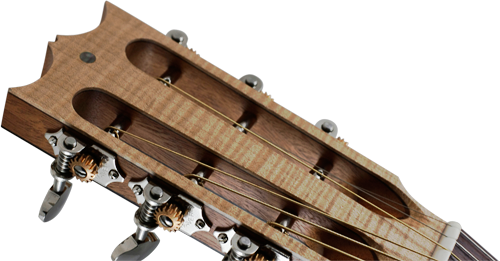 David Antony Reid Luthier :: FAQ: What Are Your RealWood Models? Finding that illusive full tonal spectrum! 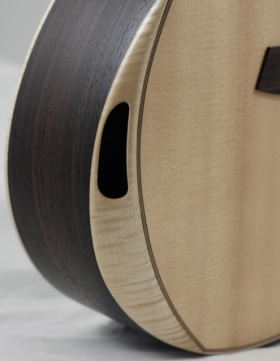 The question I am asked the most is: ‘What are your RealWood models?’ Well, my RealWood models are instruments that are lightly sprayed with a matt nitrocellulose lacquer, and finished without using any grain fillers at all. This is to optimise harmonic response and allow the entire tonal spectrum to ring through. This finish is very easily looked after, and even more easily repaired, if required. In fact, for a truly bespoke service I can re-shape neck profiles etc with absolute ease, then re-finish with even greater ease; even when the guitar is completed. To clean these RealWood models, all you require is a very slightly damp cloth, and a completely dry one to finish off. Simply wipe the guitar down and dry it off immediately! It’s that simple. And if any extra cleaning is required, a mild detergent or a very light rubdown with some 0000 steel wool can be used take off that stubborn neck grime, etc. To understand why I decided to use this finishing method, here are the details, so read on if you are interested, or can be bothered?! Whilst studying instrument making at university, I conducted lengthy laboratory experiments with many different types and amounts of finish, on many different timbers. The results, achieved using a 100% humidity cabinet, a 12% humidity cabinet, typical construction environment conditions – usually 45-55% humidity – and then equations to calculate moisture content, were, quite frankly, seriously surprising! It would seem that a heavy gloss lacquer helping greatly to protect your instrument from the environment is a great misperception. Quite simply, wood is hygroscopic; and even when completely soaked in several coats of Acid Catalyst lacquer – the finish that showed the highest level of protection – the wood still absorbs, or loses, the moisture from, or to, its environment. Further to that, it is very surprising how little an amount of finish is actually required to protect the outside of the instrument from dirt and grime penetrating the timber. Therefore I concluded, that all that heavy gloss finishes were doing, was restricting the instruments movement. The violin family of instruments do not suffer sacrilege in this way, so why the guitar? These guitars really sing, and I love making them. People have conditioned themselves to the sound they expect from a heavily finished instrument, and they generally like shiny things; it’s time for a change! Your instrument is a tool, not an ornament. I feel that seeing the “Real Wood” as nature intended it is one of the greatest bonuses of this method. If you’re not a stick in the mud, and can open your eyes, and ears, you would do well to test one out!